We want to deploy Logic Pro X in one of our computer labs. As Logic wants to download huge amounts of additional content when installed and our users are not admins on the lab machines, we have to deploy the additional content as well. These are the steps I figured out to install the additional content packages via our software deployment. You will then end up with a list of the packages. Some updated content is added via App Store. So maybe there is a better way to do this. open the terminal and enter "defaults write com.apple.appstore ShowDebugMenu -bool true"
Start AppStore.app and open the Menu 'Debug > Show Download Folder…"
Allow Logic to download the content, but, when asked for your admin credentials, click 'Cancel'. Do NOT install anything at this point. Navigate to the ausic apps download folder, You can find it in the same folder as the 'iTunes Download Folder'. It will look something like this '/private/var/folders/nc/t8zc00xs2nx1vmcjyxryf11w0000gn/C/com.apple.MusicApps' where the part in the middle seems to be a randomly generated string. In the folder 'com.apple.MusicApps' you should now see a folder named 'audiocontentdownload.apple.com' and inside that another called 'audiocontentdownload.apple.com'. Here we find what we need: the 'ProAudioCoreContent10.pkg'. Place a copy of 'ProAudioCoreContent10.pkg' somewhere else from where you can install it later. Start Logic Pro X. It will no ask you for the credential to install the package, we already downloaded. Now we come to the additional content. 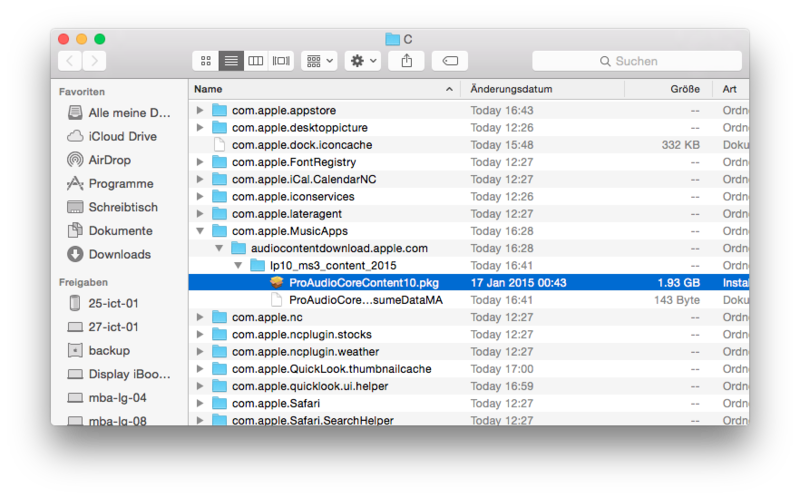 Inside the directory of the folder containing the download there should now be a folder named 'com.apple.MusicApps > com.apple.MusicApps > audiocontentdownload.apple.com > lp10_ms3_content_2015' and some more in 'lp10_ms3_content_2013'. In these folders you will now find the packages needed to deploy the additional content. Copy these packages to a safe place. When you start Logic Pro X with the packages installed, you will see that all the additional content is already installed. Thanks for this, it was extremely helpful in deploying the Logic Pro X 10.2 update with its 14+ GB of Alchemy additional content downloads. 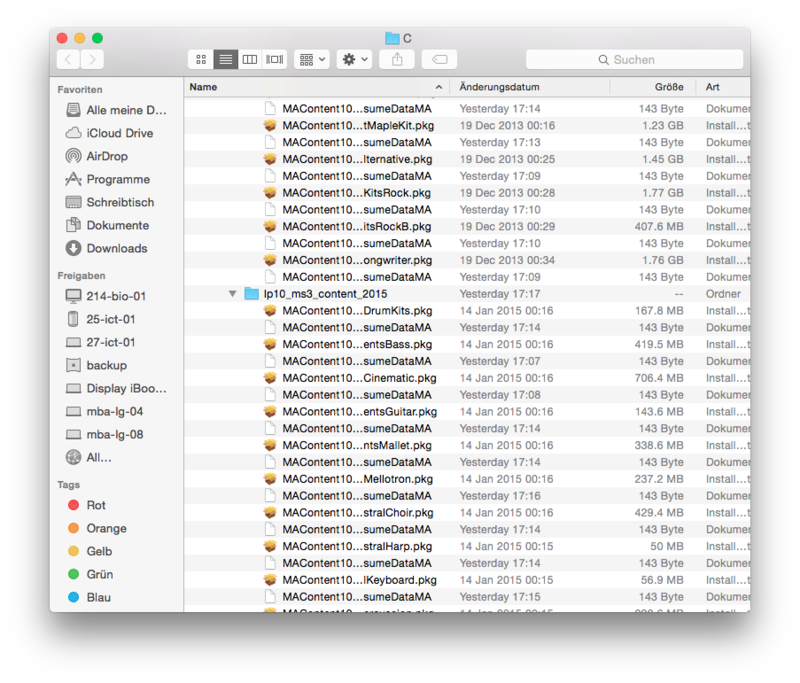 It saved 100's of GB of duplicated contents downloads across many workstations. I had looked and not found the download folder and your directions helped me find it in a couple of minutes. Much appreciated. I have just updated my utility that get's all the download links to the additional content. Thanks for the instructions. A question, though: there's so many packages to install (especially with the new Alchemy content): how can I batch install all the pkg files at once and not have to install them one by one? Yes that is a challenge. I am currently working on an installer but this may take a while to complete as I do it in my spare time. You can however try running the following command in the terminal.